Solar backup systems can provide backup power to homes and offices for an almost indefinite period of time, keeping you safe and productive during the worst power outage scenarios. Whether adding to your existing system or putting in a new system, solar based backup power is an option to seriously consider. If you’re looking for a more traditional residential generator solution, Green House electric is a licensed installer for that too. If you want the most bulletproof solution for your home, consider a system that includes both solar battery backup, and a gas generator for the ultimate “off-the-grid” solution to energy storage and power backup systems. Green House Solar is a licensed NJ electrical contractor with extensive experience in the design and installation of power backup systems for home and commercial use. 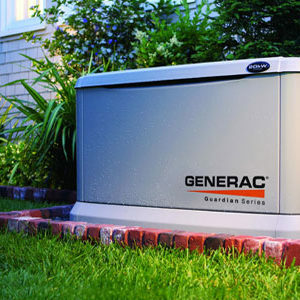 We are authorized dealers for the GENERAC brand of home and commercial generators, one of the best selling generator brands in the United States. We can recommend the right generator for your home or commercial property whether its integration of a portable gas generator into your breaker panel, or a permanent installation of a fixed Generator to power your entire home or office building. And of course we also provide solar backup power systems. These systems are the most sustainable solution to backup power, and can last almost indefinitely when sized and installed correctly. They can even be combined with traditional gas powered backup generators for a truly “bulletproof” solution. Green House Solar is also proud to be a certified Sonnen Battery installer. Sonnen is one of the best options for a solar backup system due to its self-learning software that helps optimize self-consumption and manage time of use electricity rates, insuring you get the most out of your (power). Call us today to discuss your backup power needs and get a free quote.